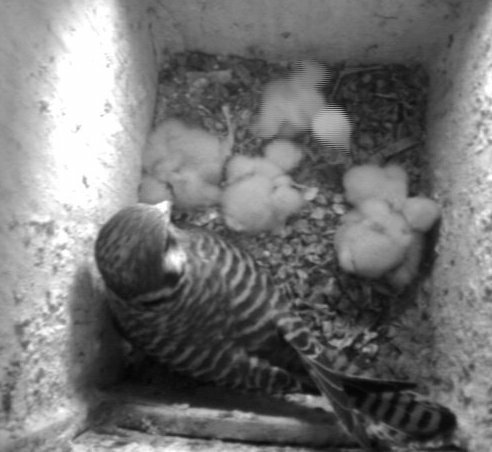 This lathe turned kestrel box with fitted video camera was erected in the barnyard on March 30, a month before our kestrels usually begin nesting. 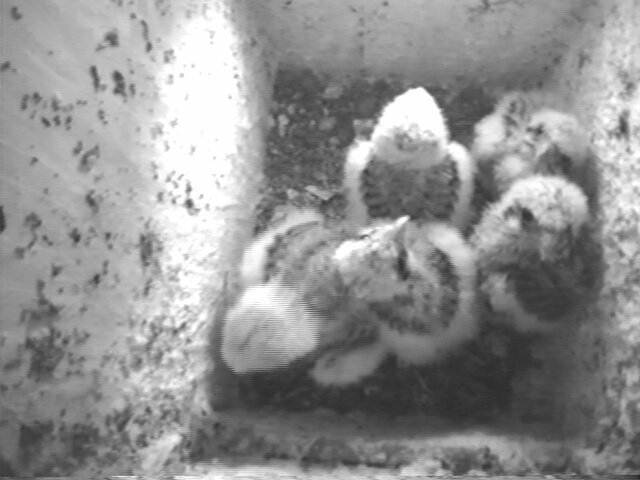 After raising the box, I opened their old wall mounted box to block the entrance hole and was surprised to find 5 eggs. 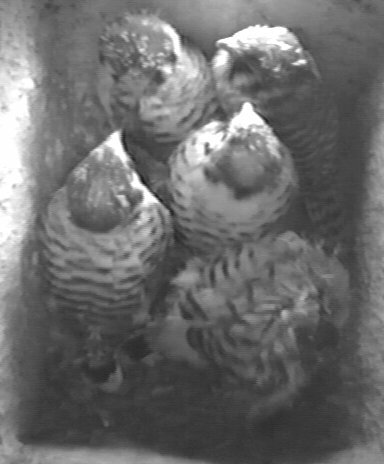 The kestrels had won a year's reprieve before they will be evicted from the barn wall and forced to use the classy new deluxe apartment in the sky. 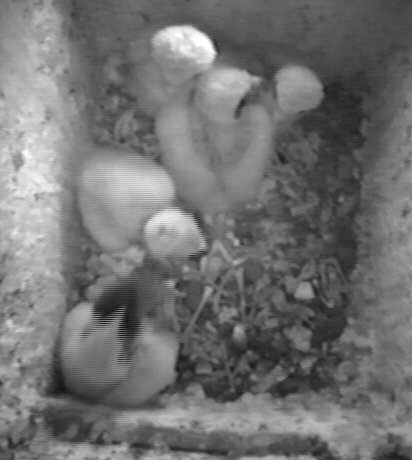 After their eggs hatched, a video camera was mounted in the old box and is currently running around the clock monitoring the 5 nestlings. The following still photos are taken from a single frame of video from the vhs tapes. This process results in a substantial loss of quality compared to the original camera image and vhs tape. 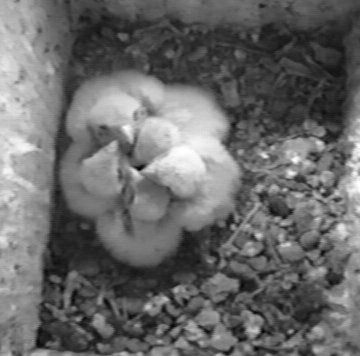 However, the rapid development of the nestlings is apparent in this series. 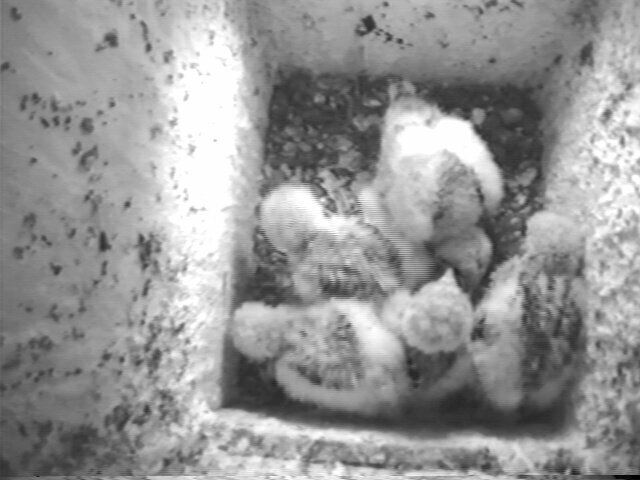 The one female and four male nestlings were fascinating to watch for almost a month as they rapidly developed and became adept at tearing apart their food. 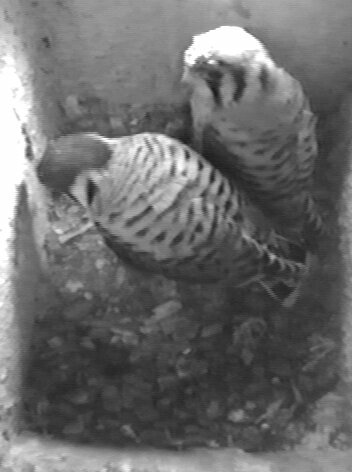 During the early nestling phase, the adult female broods them and the male delivers all the food. He calls to the female from a nearby perch and she leaves the nest to accept the vole or other prey and returns to the nest where she tears it into small bits and feeds the quite patient young. 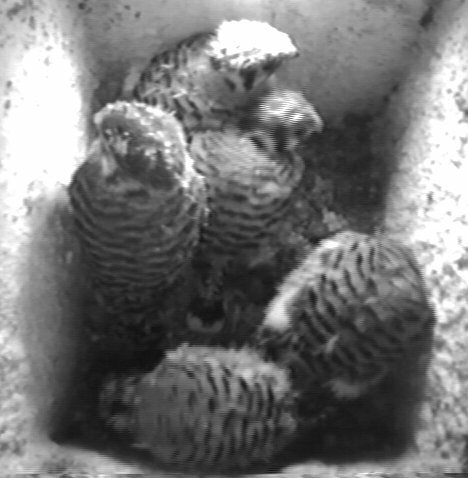 Even though kestrel young don't hatch on the same day, when food is plentiful, there is seldom a runt (a younger bird who fails to compete for food and therefor develops at a slower rate). 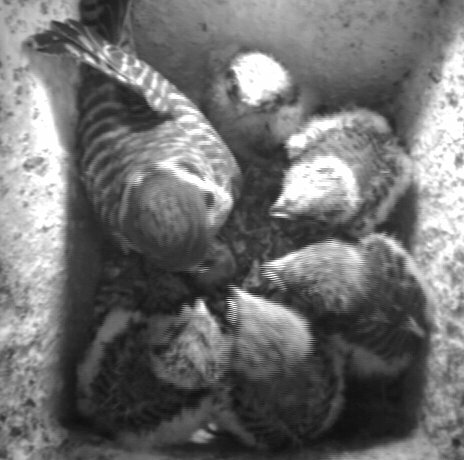 The female made sure that all the young were fed in the early stage. 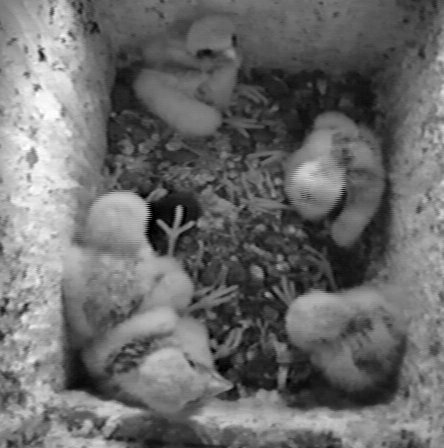 And later, when the adults just dropped the voles through the entrance hole, all the nestlings received ample food and there was less competitive behavior than in a songbird nest. When first learning to feed themselves, the nestlings always tried to swallow the hindquarters whole. Often a nestling would go several minutes with the back legs and tail of a vole hanging out its mouth, finally either managing to swallow it or working it back out, whereupon a sibling would pick it up and do the same thing. 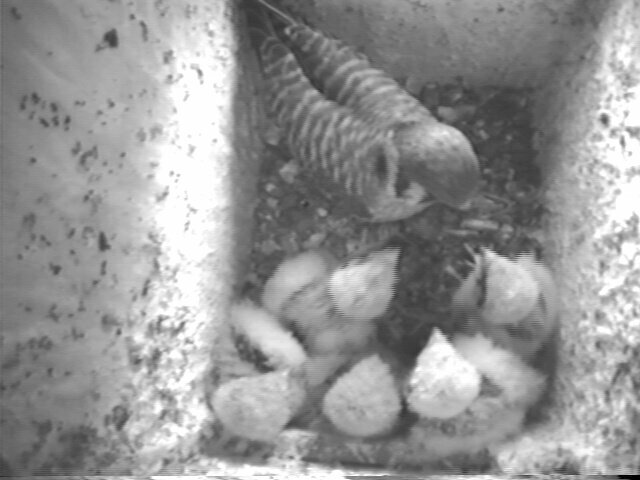 Eventually they began spending more time tearing up their food in proper kestrel fashion. 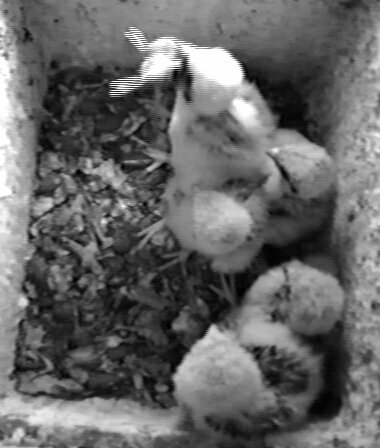 We were away when the first nestling fledged on May 24, but, luckily, caught it on tape. The one female was the first to leave the nest. 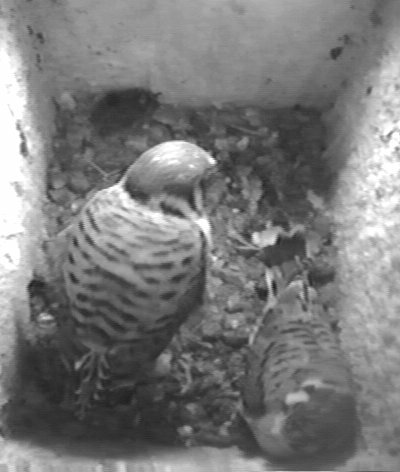 Several minutes prior to fledging, she seemed to be building up confidence, squirming at the entrance hole, then dropping back down to the floor to spread a wing, as if checking that she had one. All the nestlings had been taking their turn at the entrance hole for several days, but only to receive prey, not to prepare to leave. 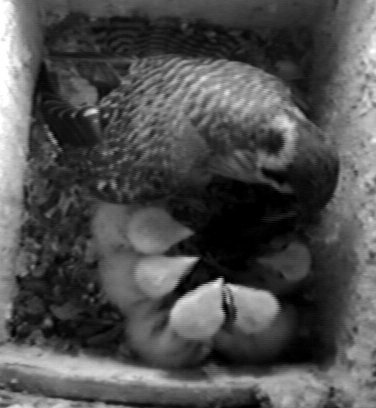 When the first nestling left, all eyes in the box were riveted on the entrance hole, as if this caught all of them off guard. Now there were four. 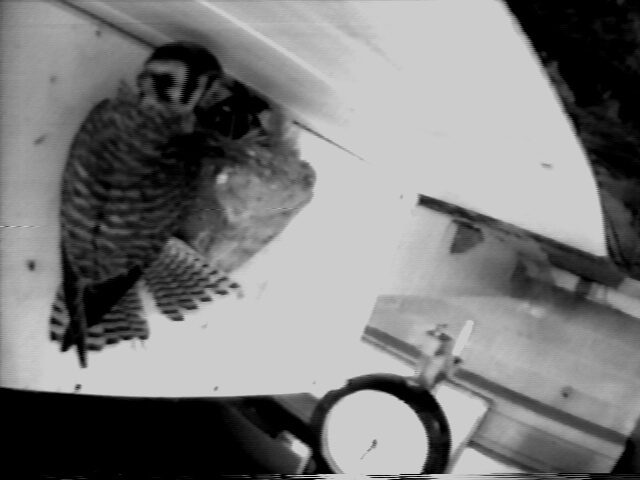 The tape cut off before the next two fledged, but, when we returned that evening, there were only two males spending the night in the box. 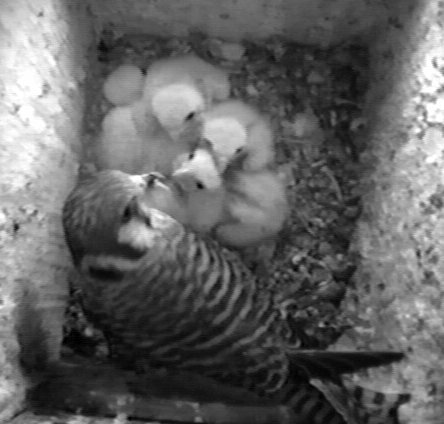 The next day, May 25, they showed no interest in leaving the nest. 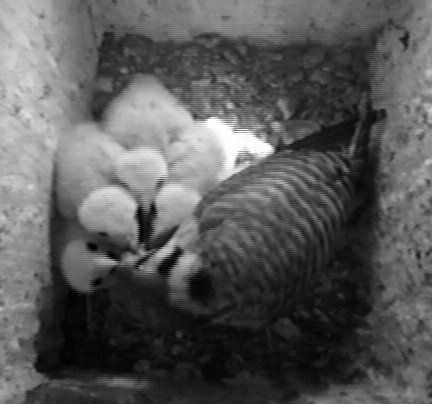 Plenty of food was being dropped through the hole and the female would drop in now and then to check on them. 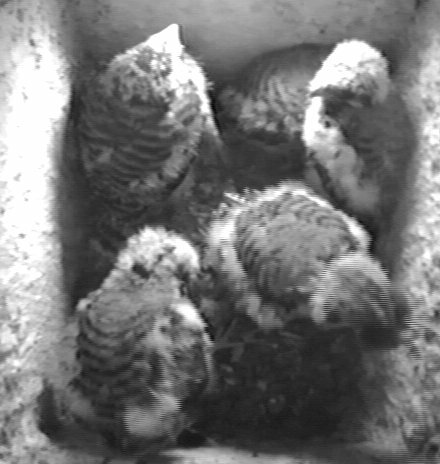 They ate, preened and rested all day, seldom even looking out the entrance hole. The following day they fledged, leaving behind a fresh vole. Food was not withheld to encourage them to leave, as I had believed. When it's time, it's time. While it is quite common for the entire brood to fledge with no problems, the first week or so outdoors is a different matter. 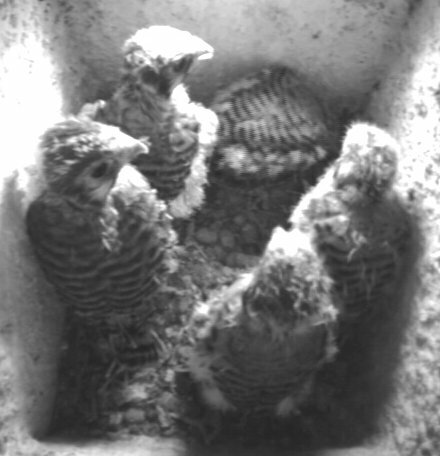 For the first time, today, June 7, I observed all five young at the same time. They had survived so far, with their parents feeding them. Three were seen on fence posts in our neighbors very short grass, dropping down to catch insects. The other two were on high perches, probably waiting to be fed. Their free lunches are just about up. The adults no longer swoop at me when I approach a tree harboring one of the fledglings. 6/21/2001 update: All the fledglings have dispersed except one male who is still hunting our neighbor's short grass for insects. He spends most of his time perched on fenceposts and seems to be enjoying himself. The adults totally ignore him. But this fall when they divide up their winter territories, he will have to go. 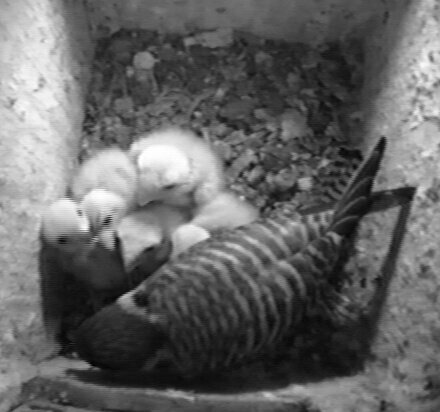 4/7/2002 update: On June 6 of last year, the female fledgling kestrel entered the swallow room and dined on young in 4 nests, making several visits on one afternoon. 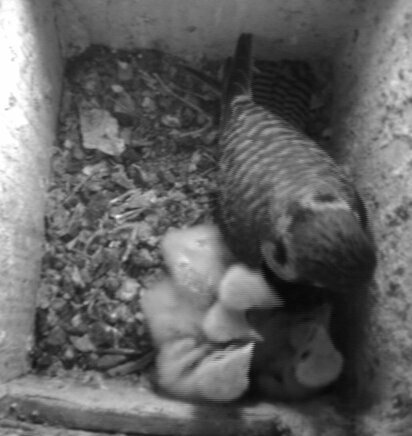 She never returned to the swallow room on later days and left the area a week later, long before her 4 male siblings. The mysterious disappearance of some or all of the swallow nestlings in four nests was quickly resolved by fast forwarding the day's videotape of one of the nests. 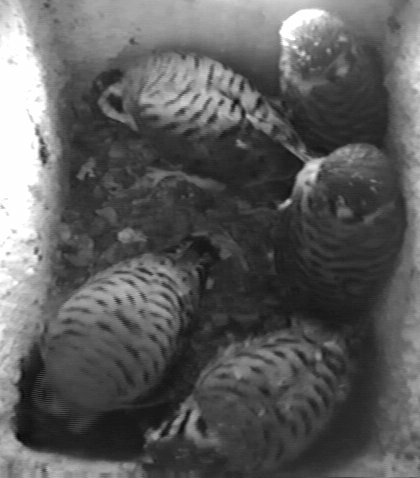 This spring, the kestrels were offered a nest box in the front yard, complete with tv and vcr, starling trap and ventilation control. 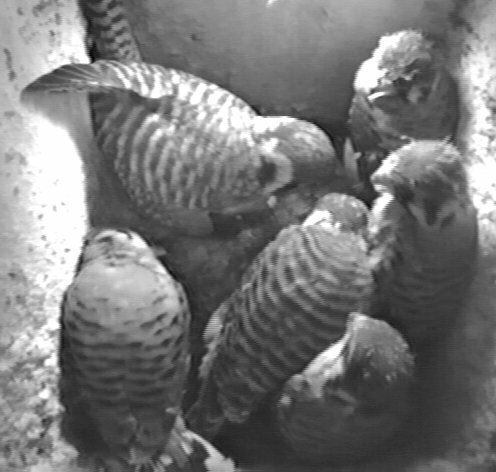 The kestrels immediately accepted their new tower and also assumed the duty of starling control. 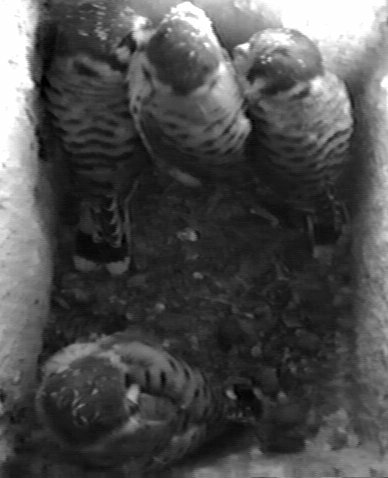 It is easy to cause raptors to desert a new nestsite at this stage, so I have stayed away. Once the female settles down to incubate, I will connect the electricity and begin monitoring the video.